When dealing with recipes around the world or just an old one from the box in the attic, you might find yourself staring at confusing terminology. 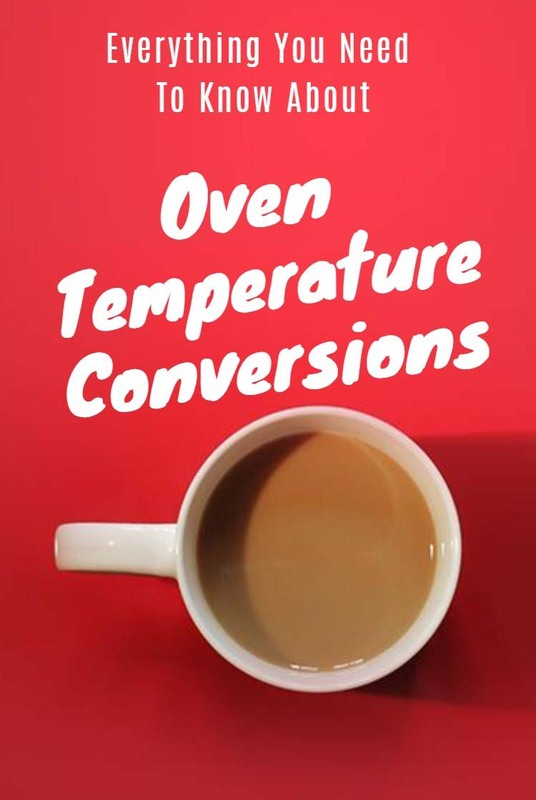 Celsius, Fahrenheit , Gas Mark and simple terms like hot, very hot are all used to describe the oven temperature. Here is an over view of what it all means and the commonly used temperatures and its equivalents. 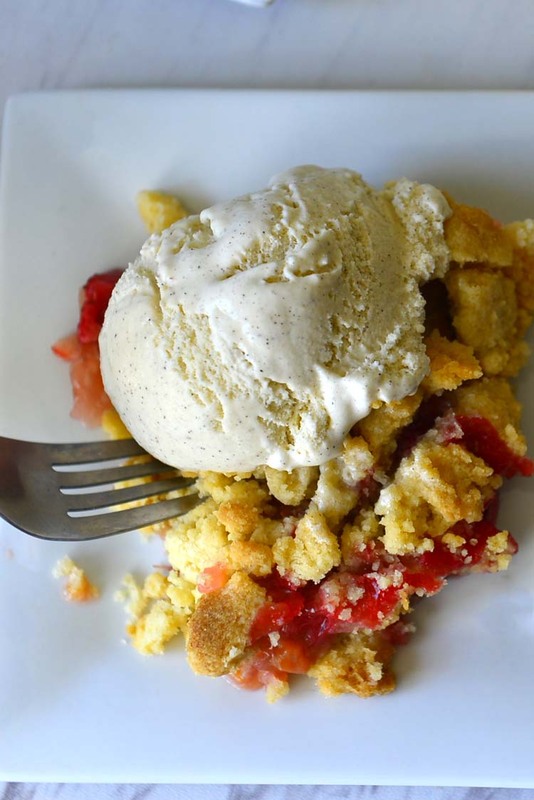 Strawberry rhubarb crumble is an easy and delicious dessert to make. The rhubarb and strawberry filling looks and tastes delicious , while the topping has an almost crisp biscuit like crunch. When served warm with a scoop of vanilla ice cream it is absolutely incredible. 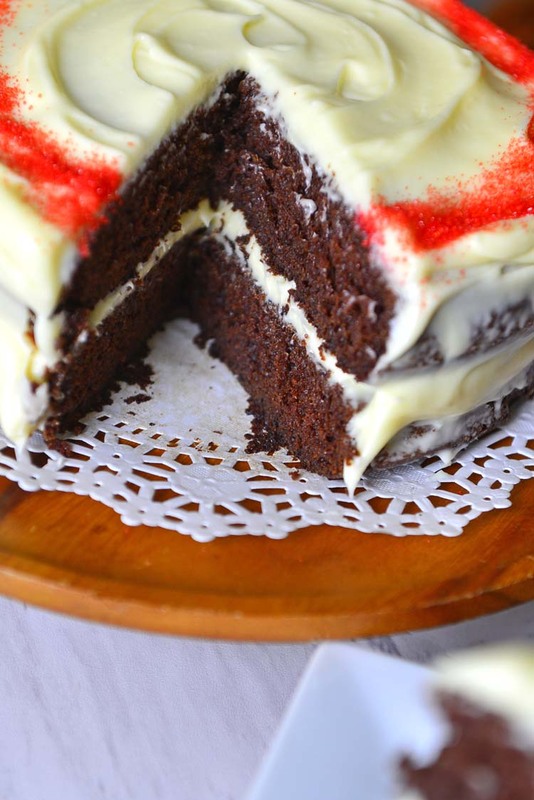 Mahogany cakes are one of the first cakes to incorporate chocolate and coffee in the batter. It is delicious, all natural and has surprisingly mild but enticing flavors. 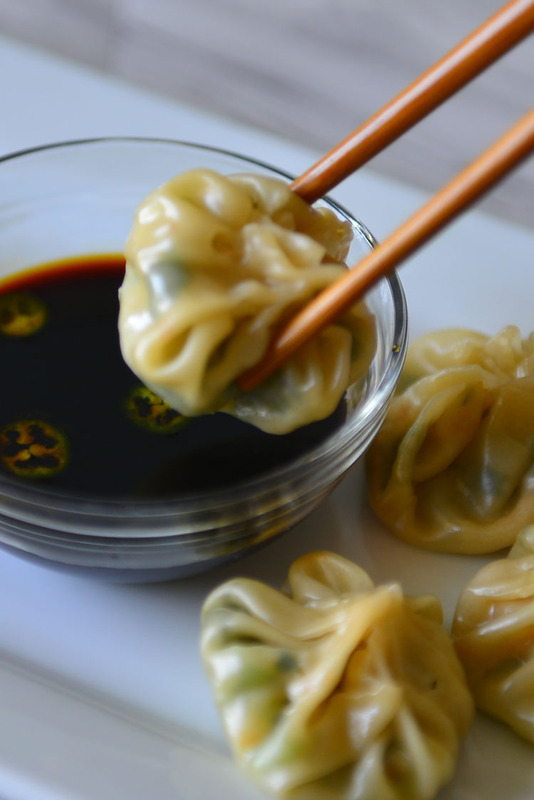 Give this recipe a try and experience it yourself ! 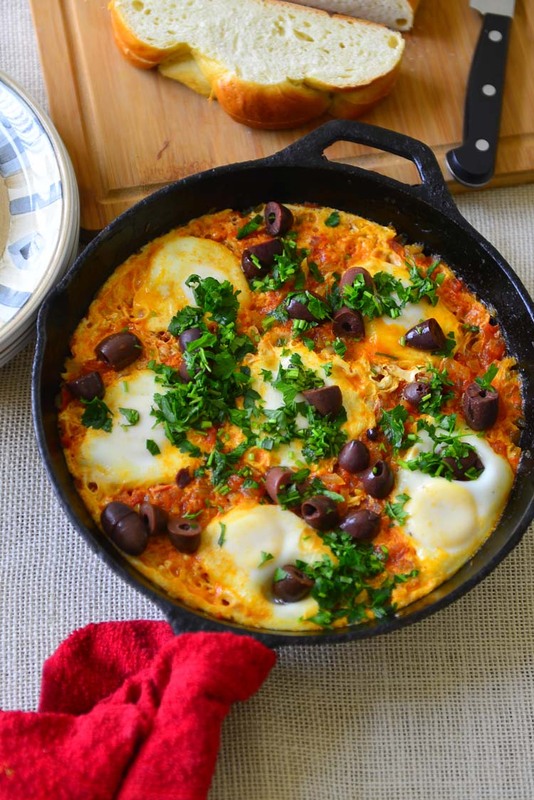 Shaksuka is a popular comfort food in the middle east and north Africa. This easy dish is made by poaching eggs in a seasoned tomato based sauce. It is easy to make and when served with few slices of bread make for a crowd pleasing quick meal. 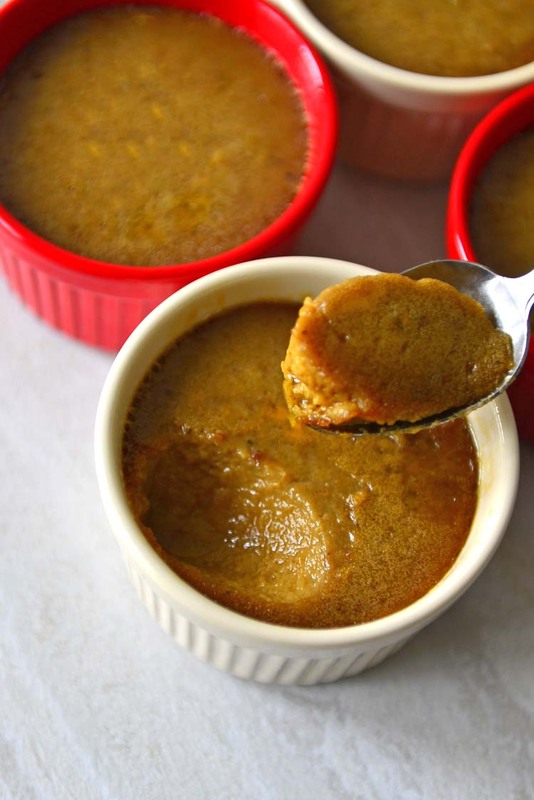 Wattalappam is creamy dairy free custard from Sri Lanka. 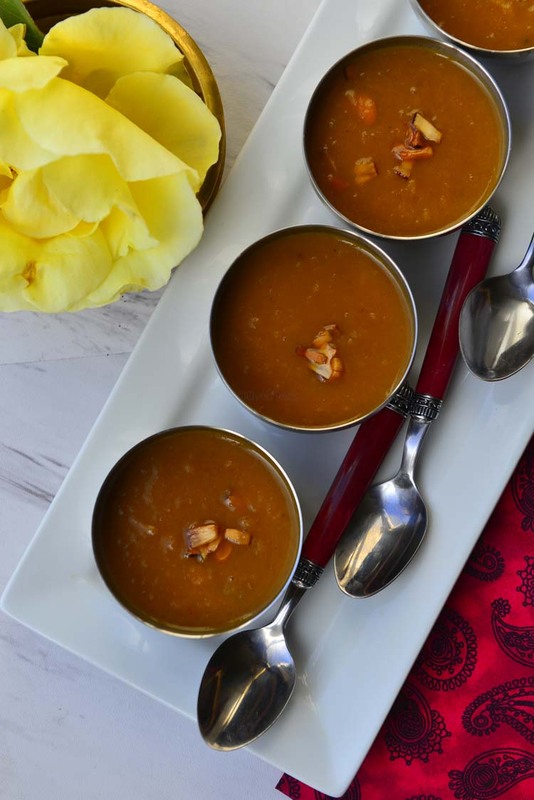 It is made with egg, kithul jaggery , coconut milk and a dash of spices. Similar to flan or cream caramel it very earthy and divine at the same time. 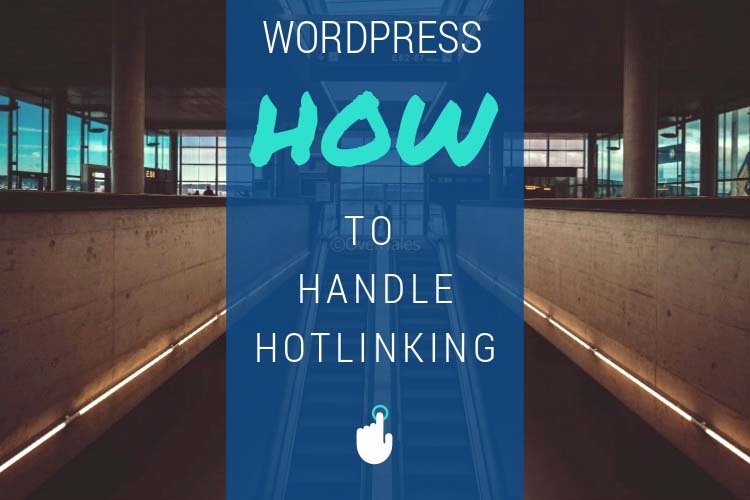 In this article I examine what hotlinking is and how to deal with it on your wordpress site. How and when to actively prevent hotlinking is to be decided case by case and here are some things to consider and a few easy ways to handle it. This is one of the easiest salads to make. 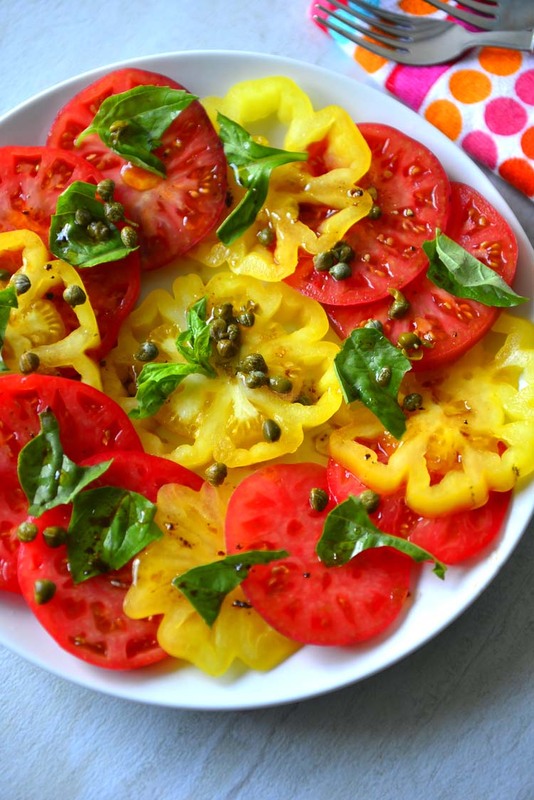 Fresh tomatoes and basil add the visual appeal while a simple vinaigrette makes the flavors memorable. Simple, easy to make and bursting wit garden freshness .. This is part one in a two part series on Vishu. This article focus on the traditions and the origin behind this festival while the next one is about how we bring a part of this to our homes 100s to 1000s miles away from Kerala. 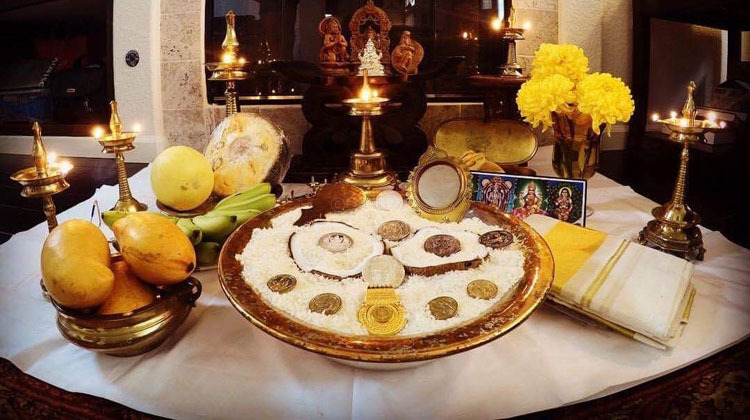 Happy Vishu ! cashew nuts, raisins and coconut slices. These quintessential South Indian flavors present a perfect ending to a feast. 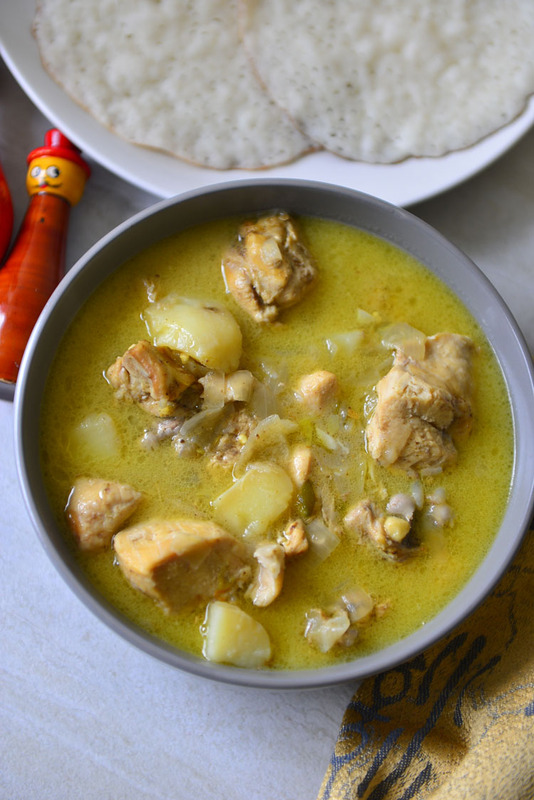 Koottu Curry is an important part of the Kerala Sadya Menu. It Vegetables and black chickpeas and cooked and mixed together with coconut and spices. A spiced roasted coconut seasoning adds the final touch. Kanji is a porridge made with rice and served with a one or more sides. Vishu Kanji is a special version made for Vishu – the Malayali New year. 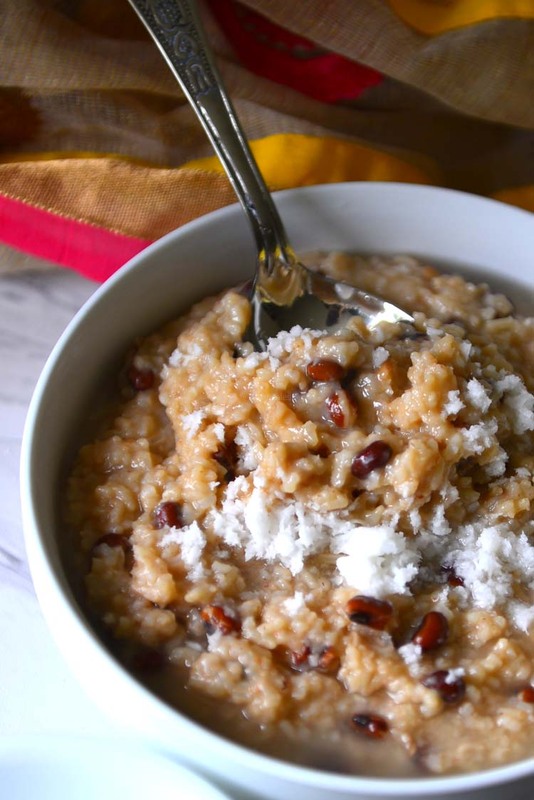 This is the sweet version of the dish in which cooked beans and rice are flavored with coconut milk and spices and sweetened with a little jaggery. 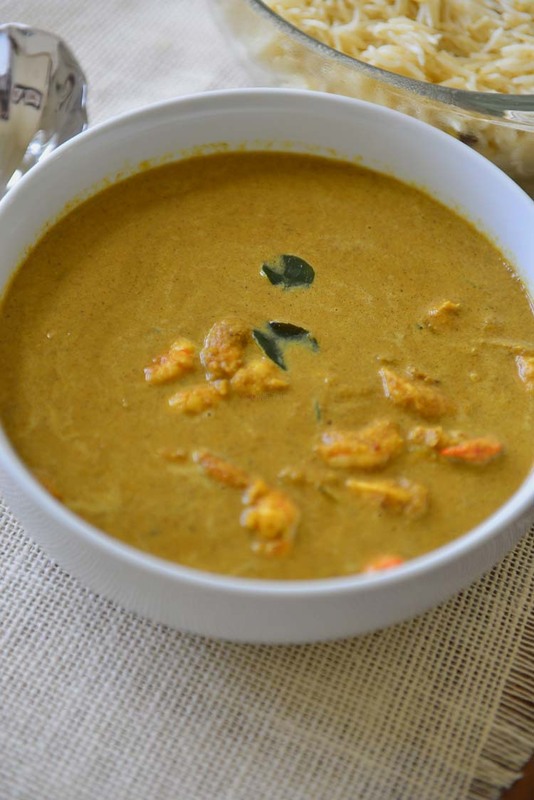 This is an popular Kerala dish in which prawns are cooked in a spiced coconut sauce. Coconut is roasted and ground giving the curry more depth of flavors. This curry is creamy and delicious without packing on too much calories. 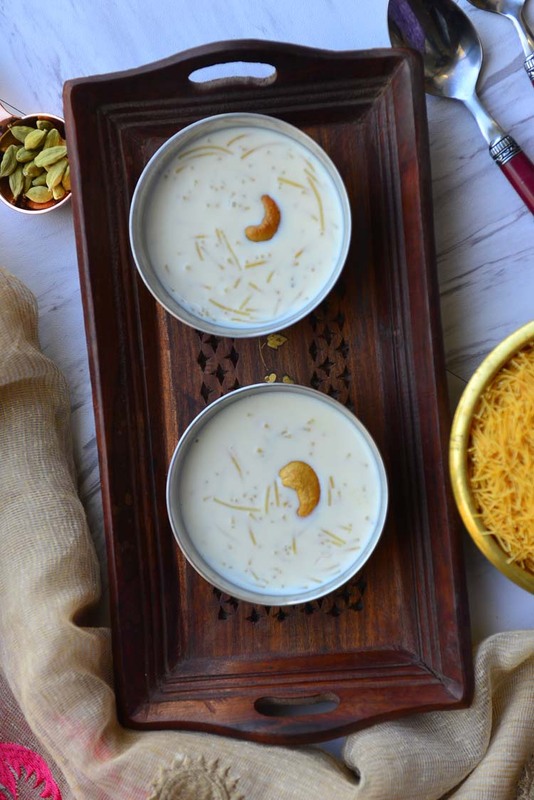 Semiya payasam or vermicelli kheer is one of the easiest Indian deserts to make. It is sweet , creamy and satisfying and often low on calories for a desert. Vermicelli noodles are cooked in milk and sweetened with sugar and flavored with cardamom . 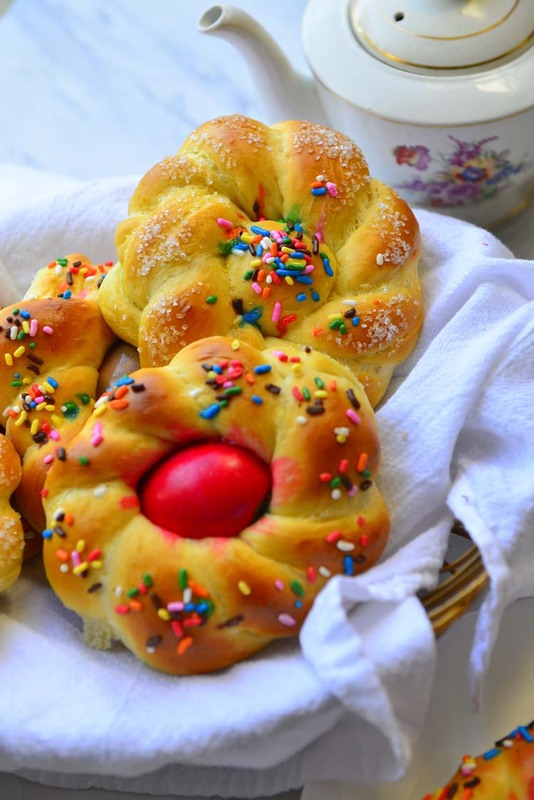 Pane Di Pasqua – this is the Italian Easter bread that is soft, sweet and absolutely delicious. 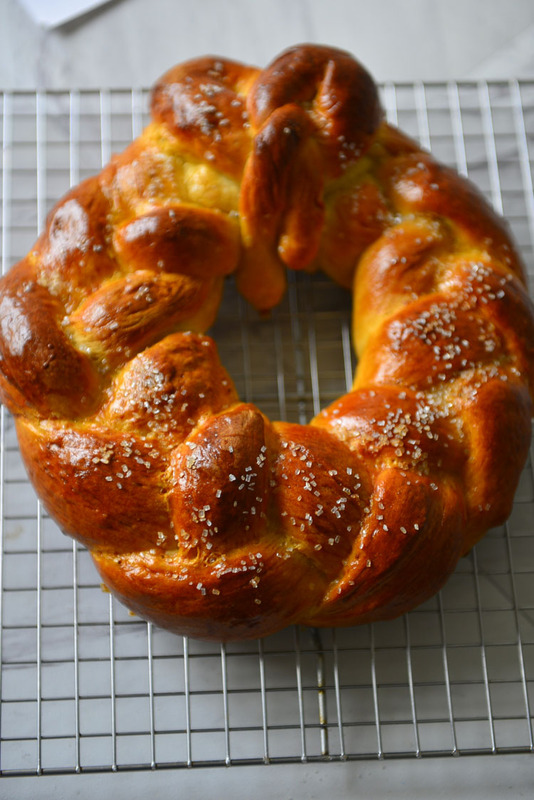 It is an enriched bread almost like a brioche and shaped into braids or wreaths and studded with eggs. These mini wreaths with eggs in the center is perfect for the Easter basket ! Soda breads are leavened with baking soda and can be made in very little time. 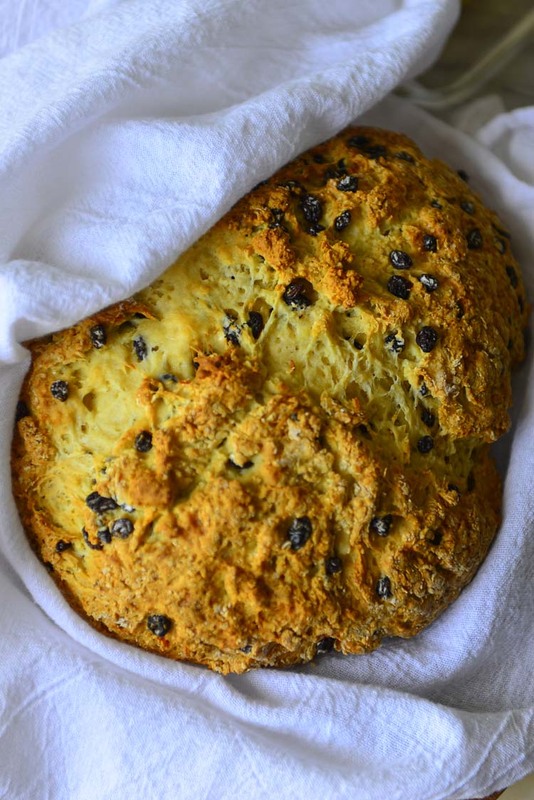 Spotted Dog is a sweeter version of Irish Soda bread with currants or raisins added. This light and sweet bread can be made in under an hour . Undan Pori is a sweet whole wheat and banana fritter. It is a quick time snack that is popular all over Kerala. All you need are a few pantry staples. Here is an easy version that is light and healthy. 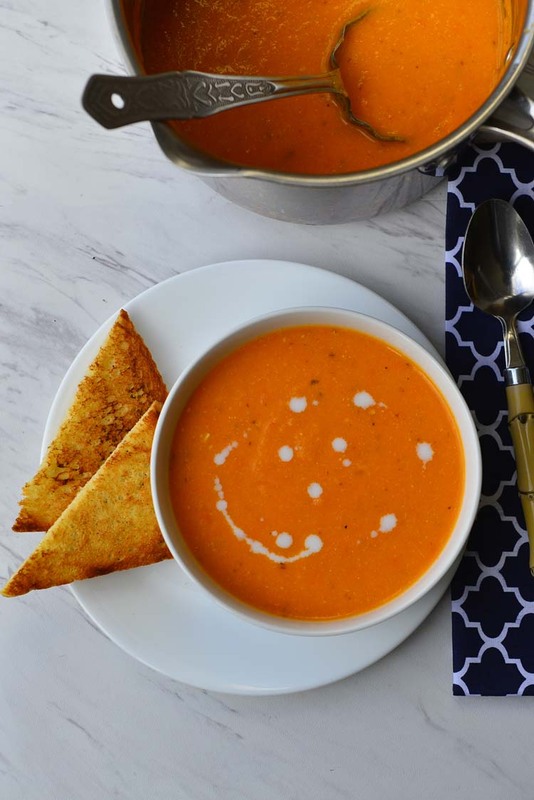 Here is a vegan version of the cream of tomato soup. It comes together fast and is fresh, light, healthy and delicious ! You will not miss the extra calories or the creaminess ! 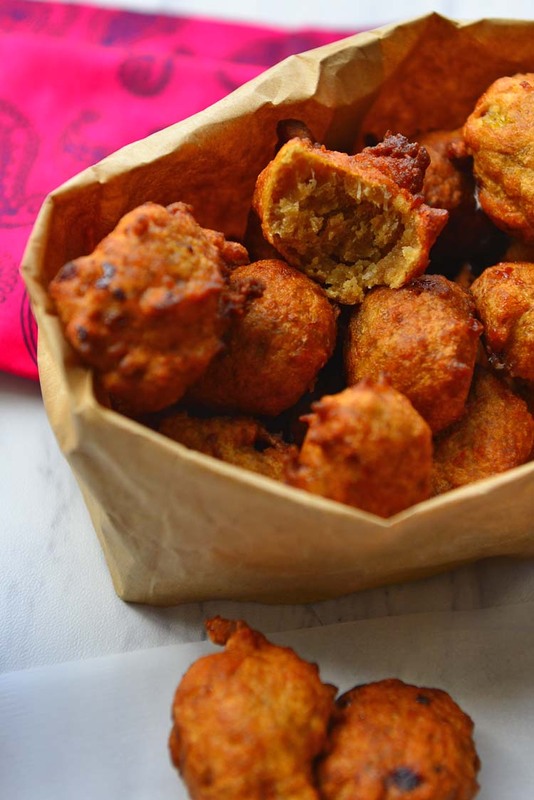 Crisp and crunchy outside and soft and spongy inside – Medu vadas are a popular south Indian snack. These are made with black lentils and not only delicious but packs a load of nutrients as well ! Fresh carrots are sweet and tastes delicious when roasted. 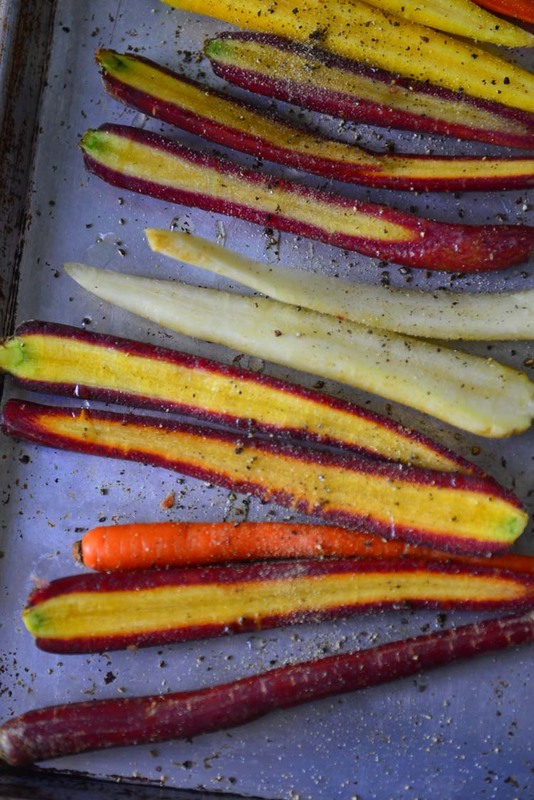 The beautiful bunch of multicolored carrots are roasted in a hot oven and tossed with garlic and parsley oil. This is a wonderful appetizer or side dish that takes very little time to make. 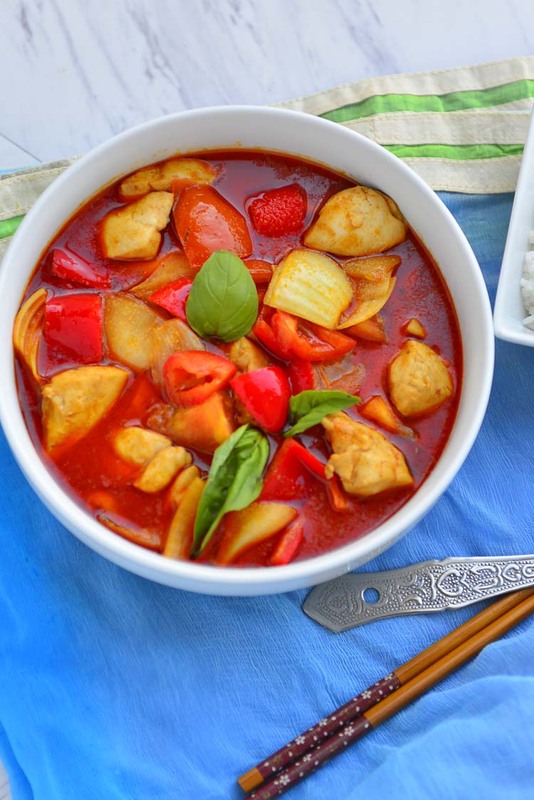 Chicken and vegetables in the exotic flavors of the Thai red curry paste and coconut milk is a perfect end to a hectic day. The best part it that it all comes together in one skillet and under 30 minutes ! Serve with a steaming bowl of rice or ditch tradition and serve with a piece of crusty bread ! 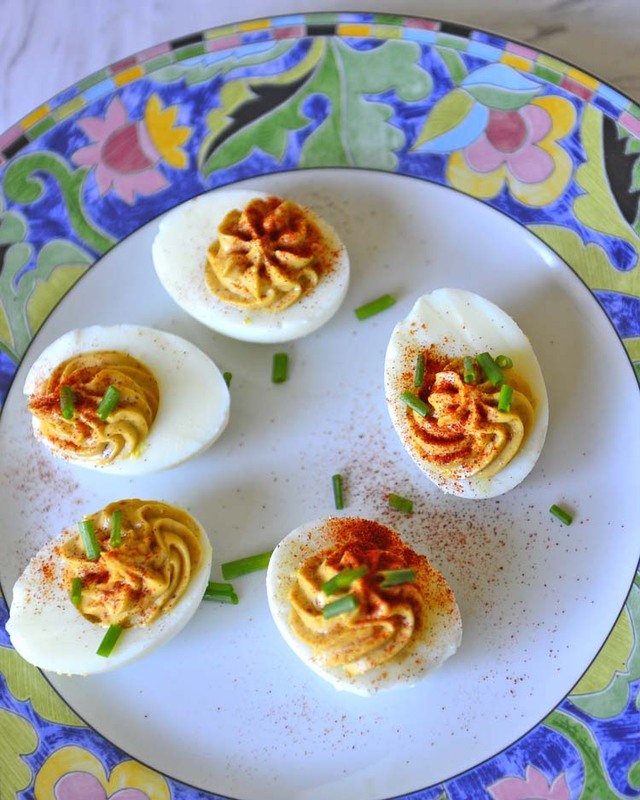 The classic deviled eggs are an easy appetizer to make. Here is a spiced up version that is hot, tangy with a bit of sweet undertones. There are so many ways of flavoring deviled eggs that I guarantee you that you will never get tired of it. Who does not like a sweet sandwich bread ? Here is an easy recipe that is sure to become a family favorite. 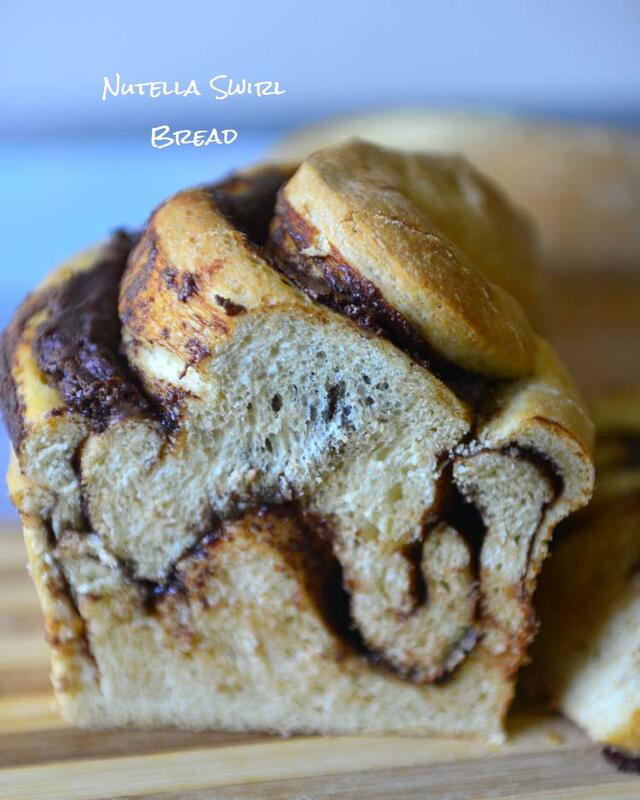 Swirls of nutella adds to the appeal of this bread. Just slice and serve ! The traditional Hummus is a healthy spread made with chickpeas and a dash of spices. 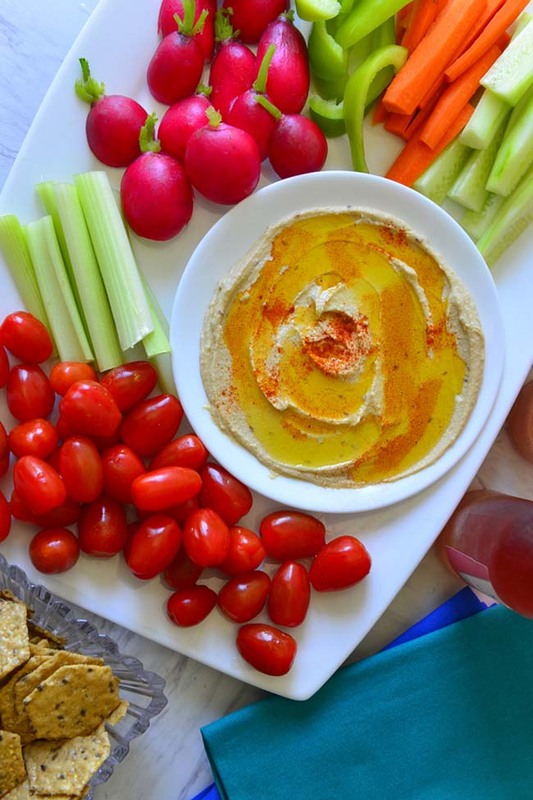 It is healthy and satisfying and a perfect snack dip to reach for. Not only is it easy to make but tastes much better as when made fresh ! heat ! 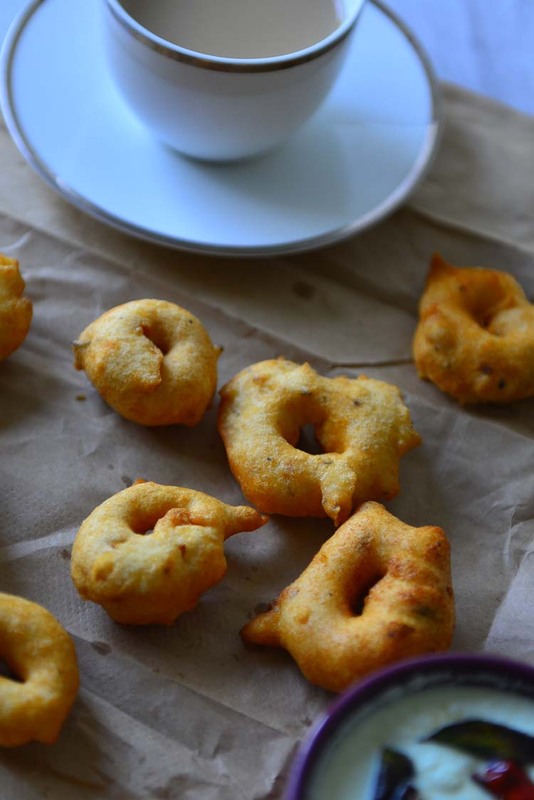 It is an easy dish to make and when served with lacy appams is a dream come true ! A Loaf Of Hot Cross Buns ! 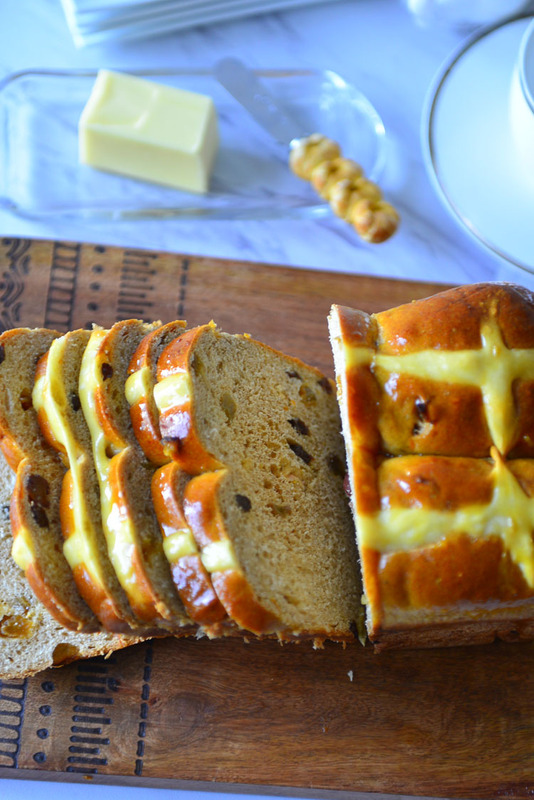 Here is a heartier whole wheat take on the popular hot cross buns. These are filled with black and golden raisins and spices. Orange zest and glaze adds a bit of citrus tones to it. Perfect to slice and toast or to make that french toast ! 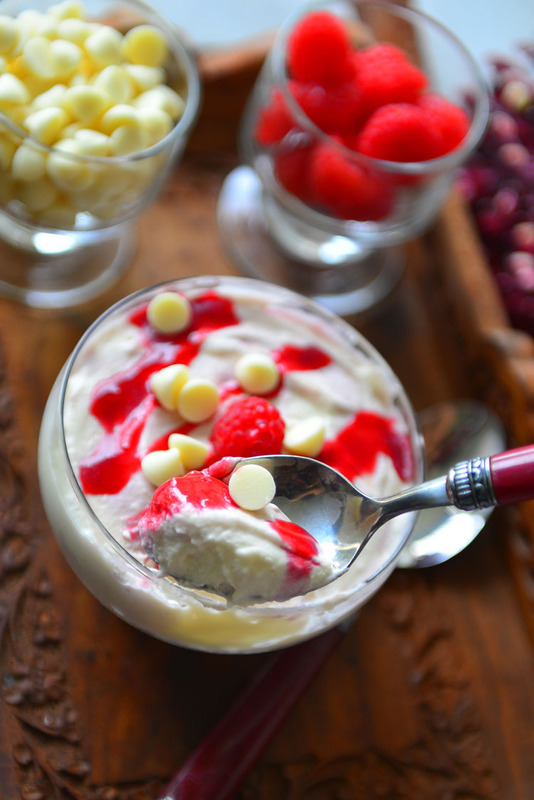 One of the easiest white chocolate mousse recipes. This one does not use eggs or gelatin , but it is still soft and perfectly set ! 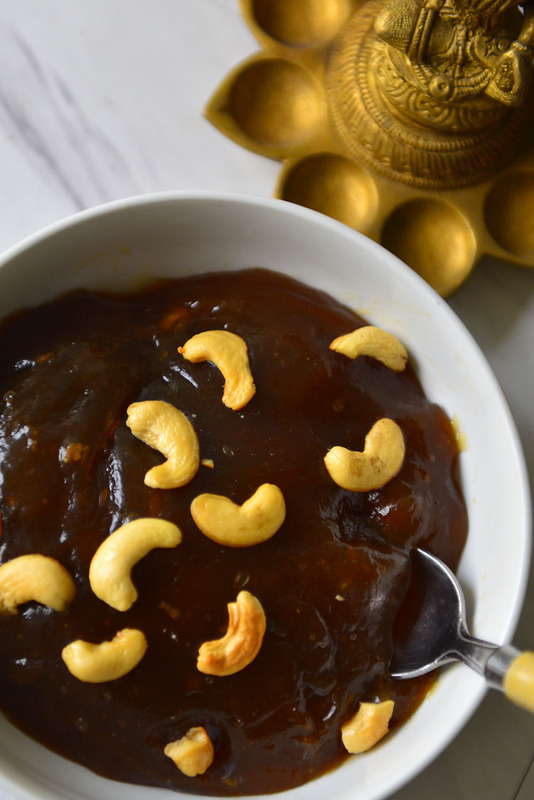 Koova kurukku is a simple and easy sweet to make. It takes only 3 main ingredients – arrowroot powder, jaggery and water. 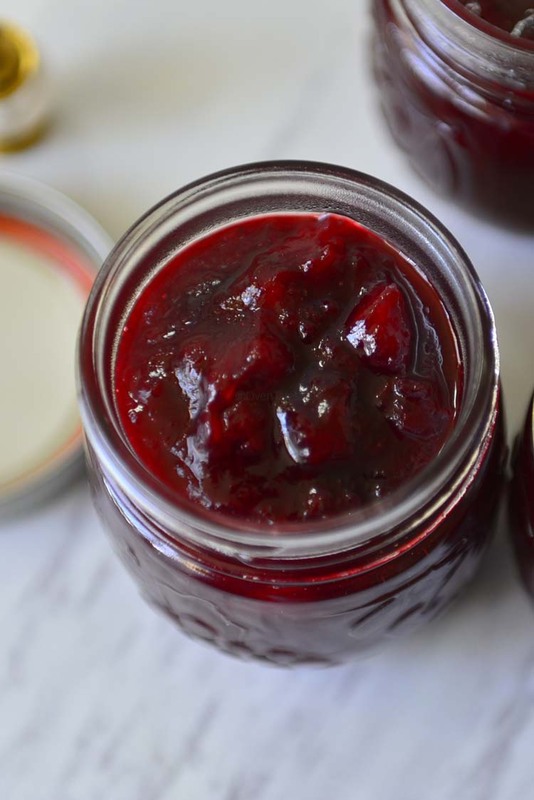 In about 15 minutes you have a sweet with jelly like consistency. A little grated coconut is added for some texture. 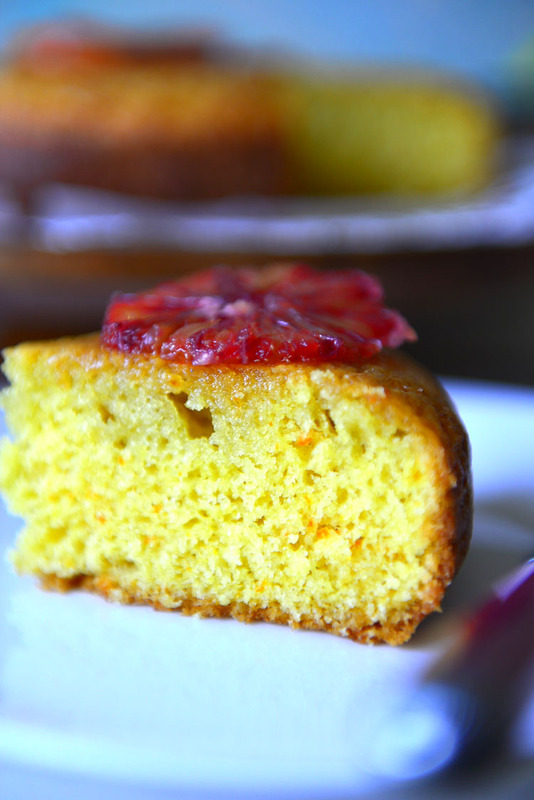 Here is a simple but utterly satisfying cake recipe – Orange Madeira Cake. Butter, eggs , flour and leavening – all the basic building blocks of a cake- and a hint of citrus , that is all it takes. I can have this any time with with a cup of tea. 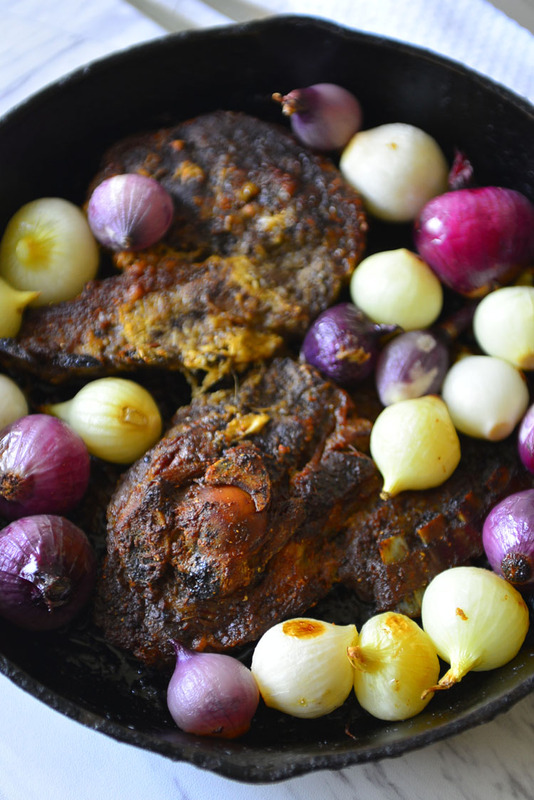 This is a popular beef dish from Kerala. bite sized pieces of meat is cooked to tenderness and coated with a mouthwatering mix of spices. Copious amount of sliced coconut and curry leaves accompany these tiny morsels — Finger licking deliciousness ! 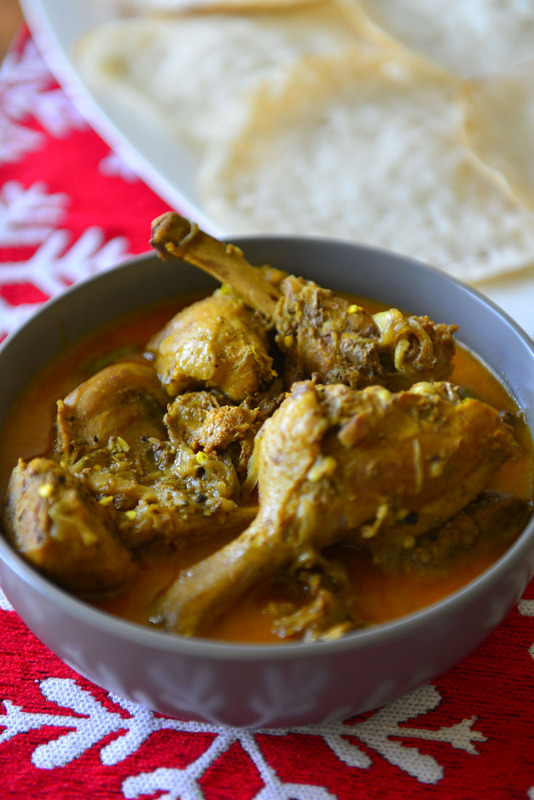 Tharavu Mappas is a a traditional duck curry from the Kuttanad. Traditionally duck is cooked in a gravy of fragrant spices and coconut milk for long . This is a lighter and quicker version but still very creamy and fragrant. Scones a re an easy treat to make in the morning for breakfast. 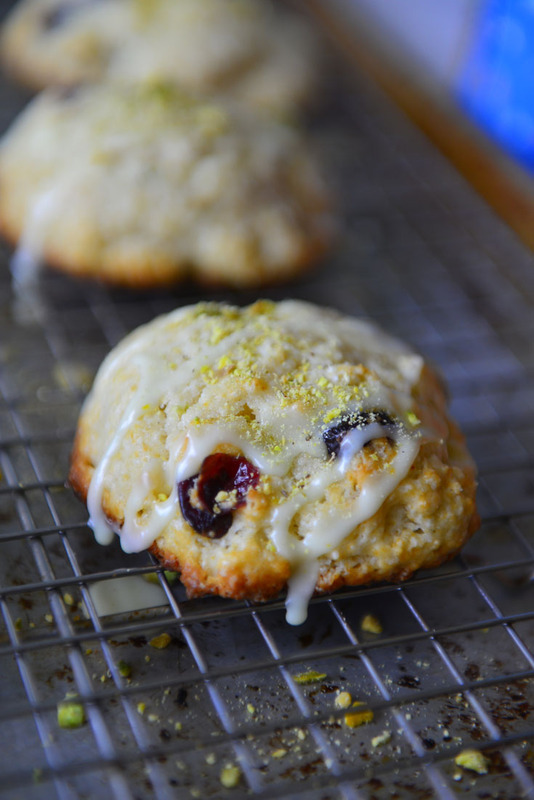 These cranberry orange scones are our favorite Christmas morning treat – easy to make and with a festive touch! 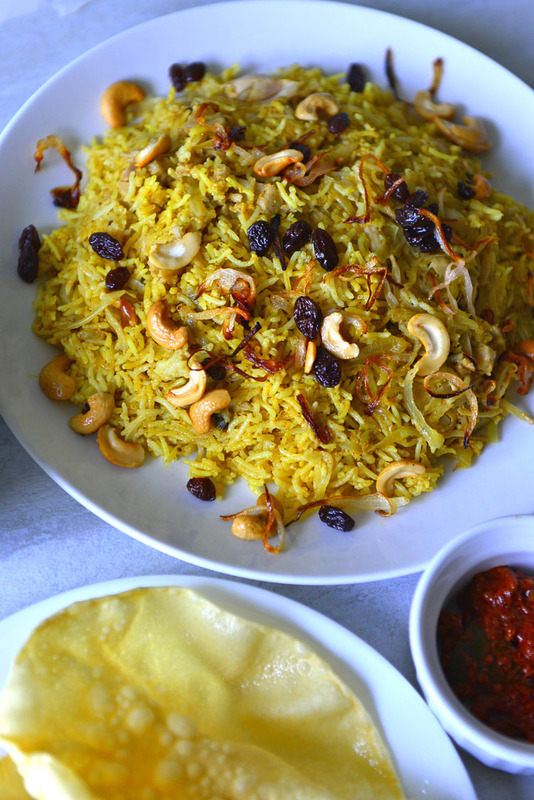 Biryanis are the popular rice casserole of Indian sub continent. Here is a vegan version made with jackfruit. The meaty texture of the unripe jackfruit is perfect for this recipe and the and chances are you are not going to miss the meat ..
Easy Sourdough Pancakes – Say No To Discarding Starter ! 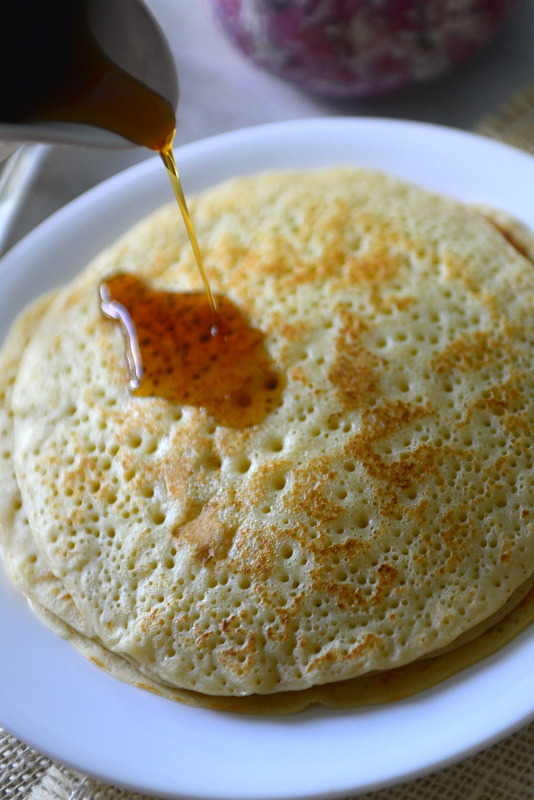 This is a delicious pancake made with sourdough starter. It is spongy and a bit sweet and tangy. The starter creates an incredible depth of flavors . 5 ingredients is all you need to create the magic ! that is not your scene – it will be delicious ! 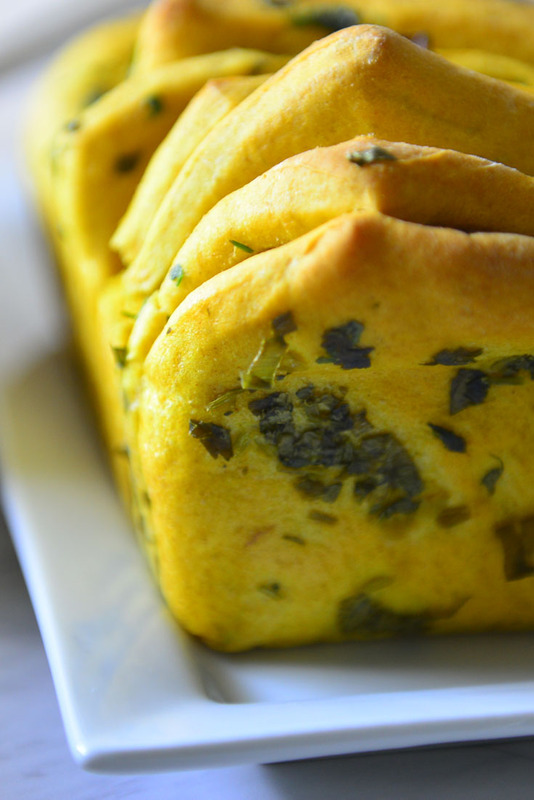 A bright and sunny loaf that is perfect to serve with a spicy curry/ soup or just as an appetizer ! 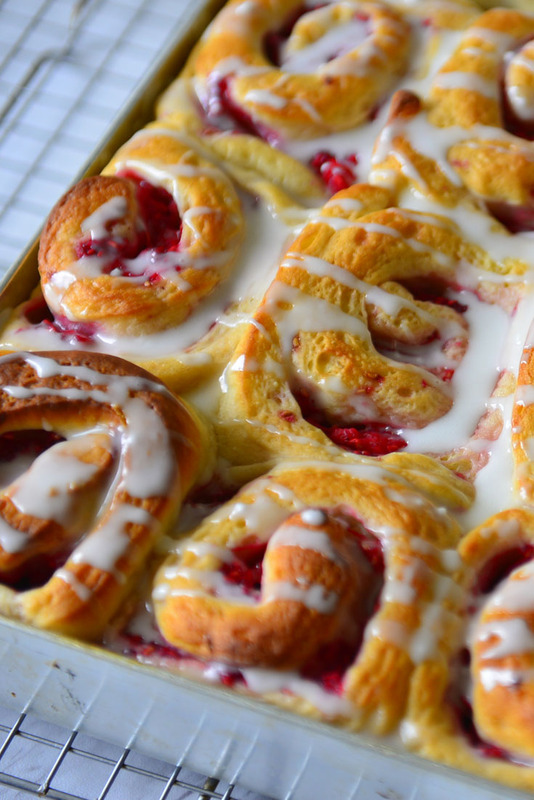 This pull apart bread is fun to make and delicious to devour . Turmeric gives this loaf its signature color while the herbs and enhance the flavors . 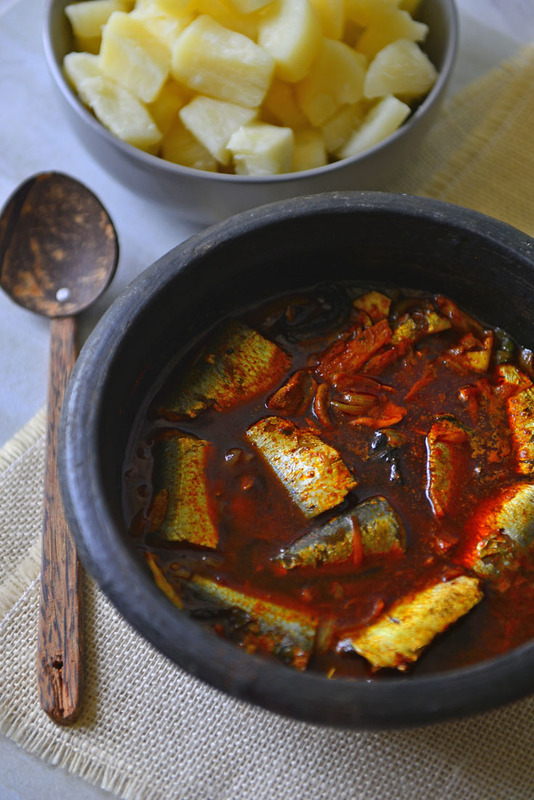 Puzhukku is a dish made of boiled/steamed root vegetables mixed with seasoned coconut paste. These are served either by itself or with Kanji (rice) and a spiced chutney. 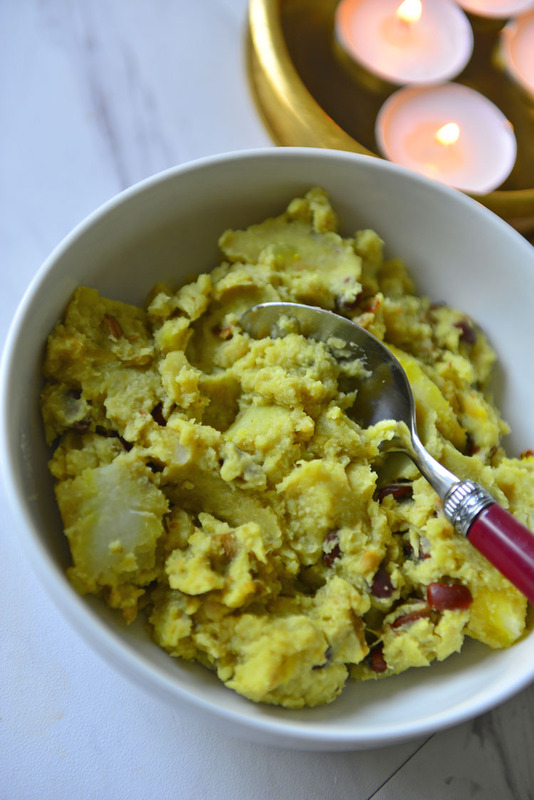 Thiruvathira Puzhukku is made with a mix of seasonal root vegetables and beans. 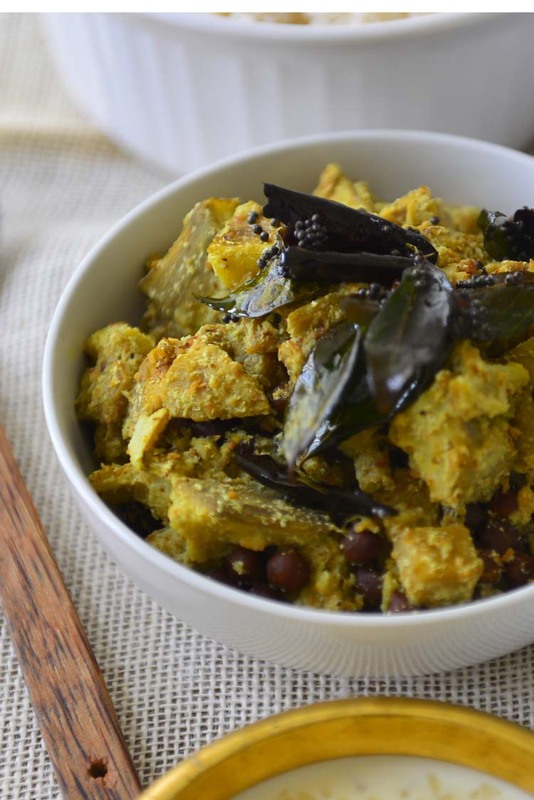 The tubers are nutritious and filling while the beans are a source of protein making it ideal for ladies who forgo rice based meals as part of the Thiruvathira rituals. Hard to believe it is almost 2018 !!! 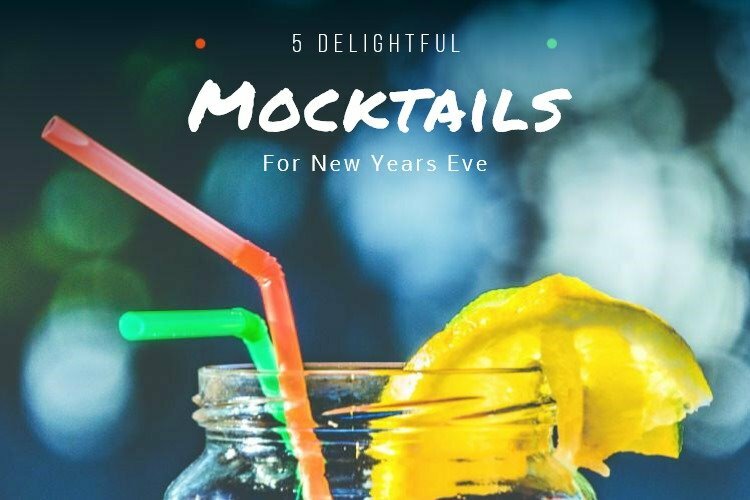 Here is something for the New Year’s Eve party – 5 absolutely fun mocktails from a few of my favorite food bloggers. 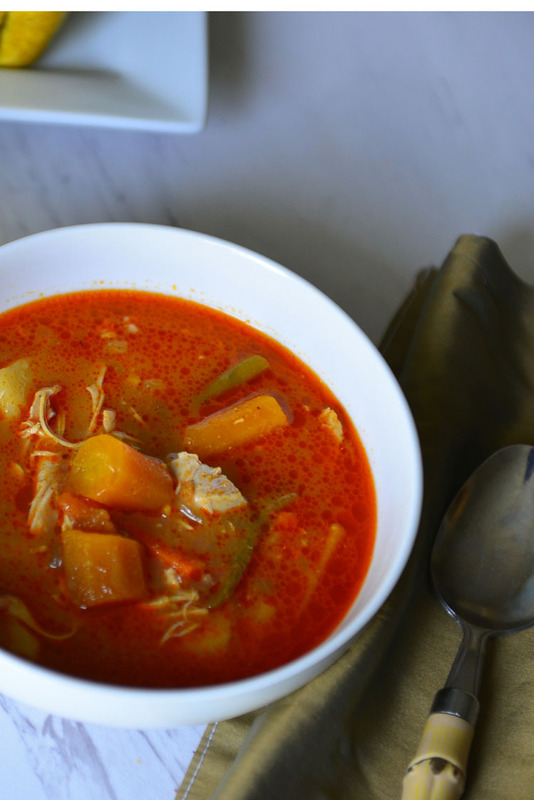 Chicken and vegetables are slow cooked with warm spices in a tomato based broth. A bowl of this is just what you need on a cold evening. As you take care of the evening errands, this soup slowly simmers and fills the kitchen with warm aromas ! Add your favorite vegetables and make this into a one pot meal . 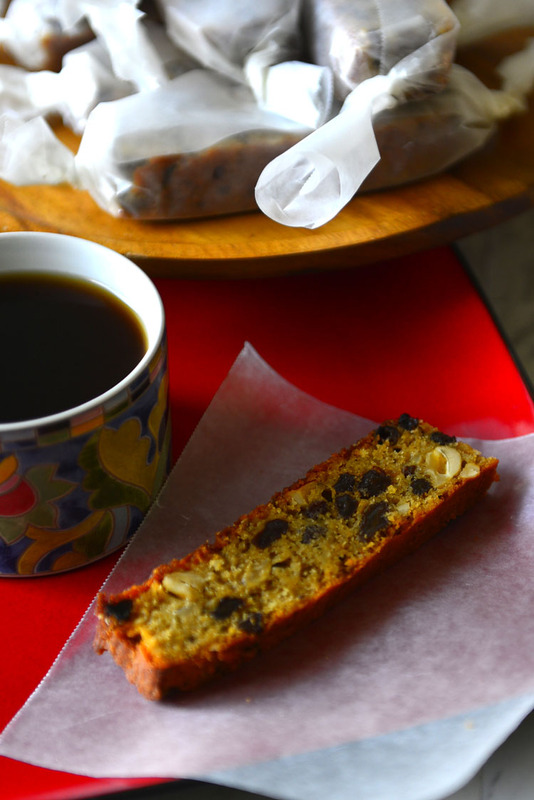 Plum cakes – the spiced dark brown cakes studded with dried fruits (mainly raisins) – are popular in Kerala all year around. Don’t be fooled by the name, there is rarely any plum in there. When we run out of all the required ingredients or are short on time we make this easy version. 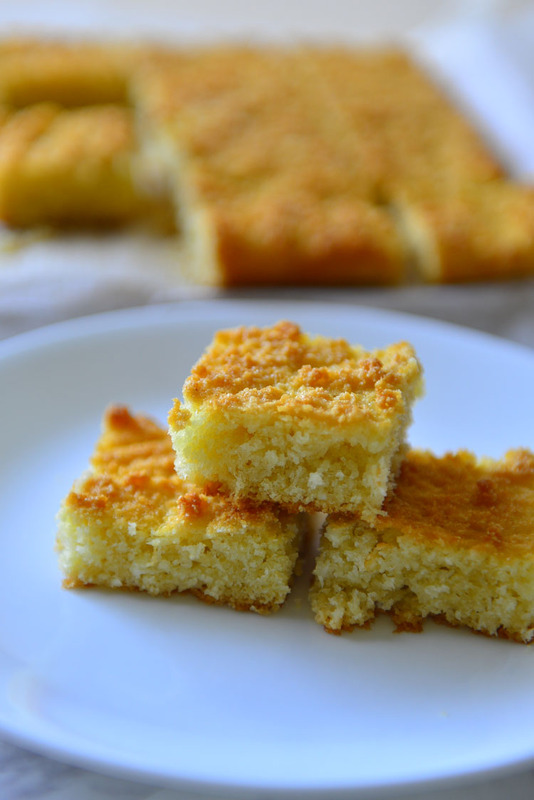 An old fashioned cake from Goa, Bathika or Baath Cake is made with semolina and coconut. 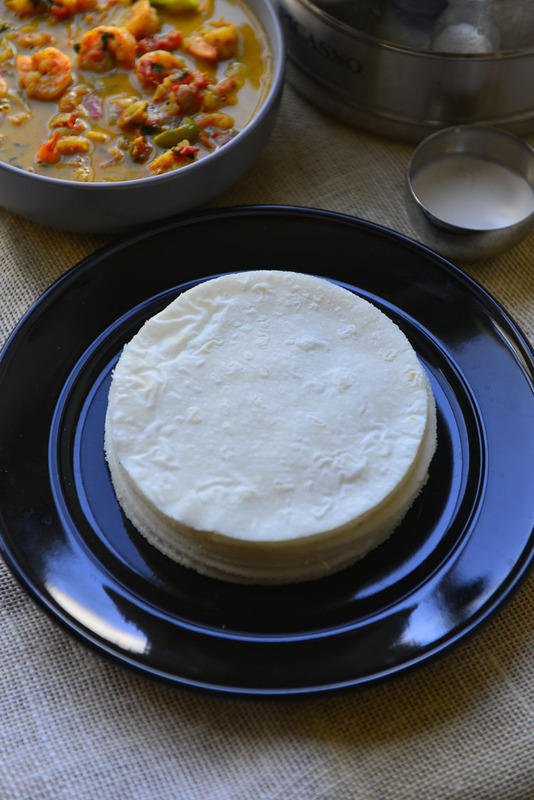 The taste and texture of this cake is unique and the flavors are very south Indian. Give it a try ! Pulla is a cardamom flavored bread from Finland. It is soft and sweet with an almost cake like quality. Delicious and pretty ! This is an easy dinner for 2. It takes about 11/2 hours from start to finish , but only 15 minutes of hands own time. A delicious high protein dinner is ready with 15 minutes of elbow grease – isn’t that worth celebrating ? Garam Masala is a popular spice blend used in Indian and other south east Asian cuisines. There are many regional variations of Garam Masala. 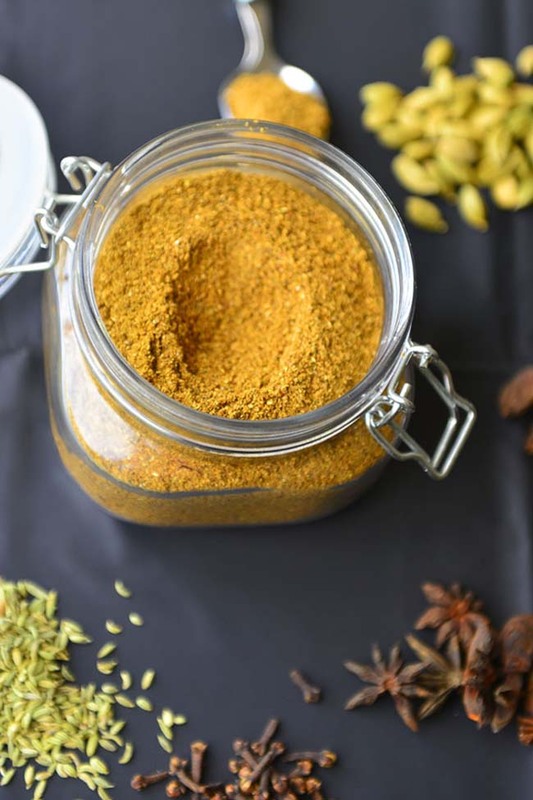 What ever the spice blend is it is always aromatic and adds a hint of warmth to the dishes. 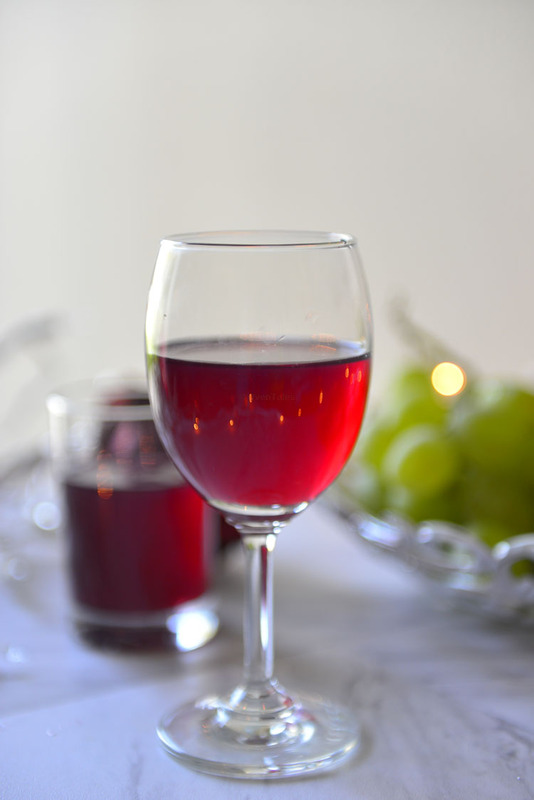 This is a simple recipe that is traditionally used to make festive wine at home. There is no need for special equipment, just organic ingredients, clean non reactive jar, a dark corner and time ! Around Christmas time we usually serve this with a slice of X’mas fruit cake. 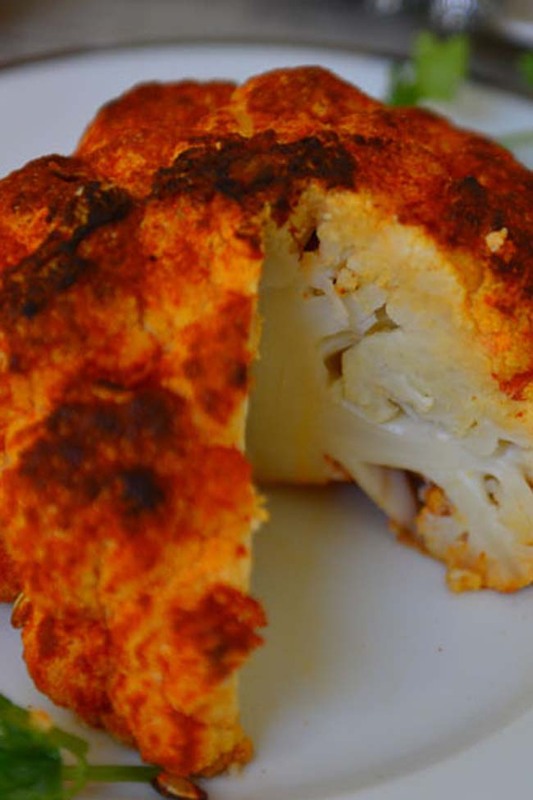 Roasted Whole Cauliflower is an easy dish to make . It is flavorful and is a treat to the eyes. The cauliflower is flavored with tandoori inspired spices and the cilantro chutney adds fresh flavors. If you are a sardine lover this is will make you very happy ! It is an easy fish curry The green tomatoes adds fresh tart flavors perfectly complementing the fish. 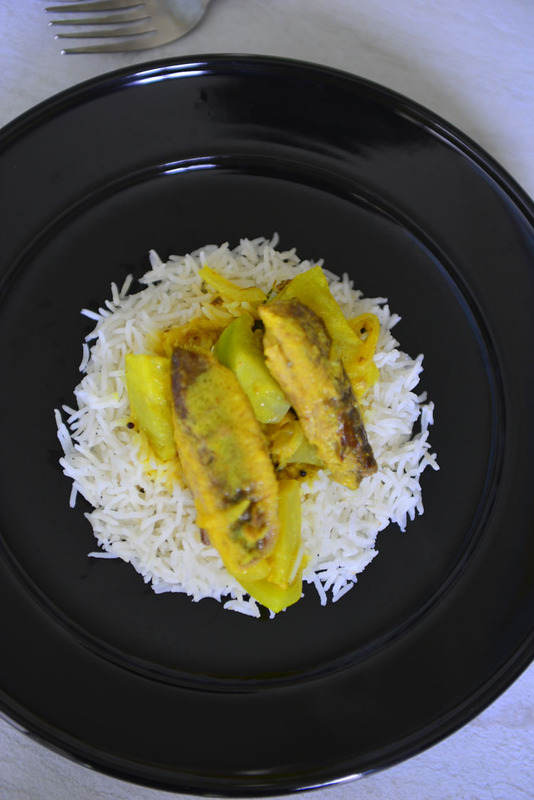 Canned sardines takes only a few minutes to absorb the flavors and you have a bright and creamy creamy curry in under 30 minutes. These are gluten free flat breads made with rice flour. Freshly made pathiris are soft and melt in the mouth delicious. These are relished with spicy curries or just some sweetened coconut milk. I love this rustic loaf ! Sun-dried tomatoes bring intense sweet and tangy flavors to the bread and add beautiful specs of color. 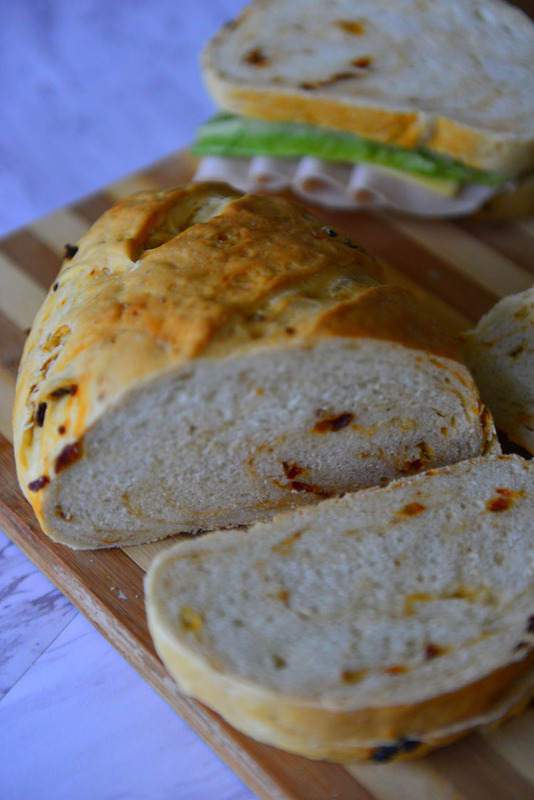 This is perfect to make a simple sandwich or to have with a bowl of soup ! 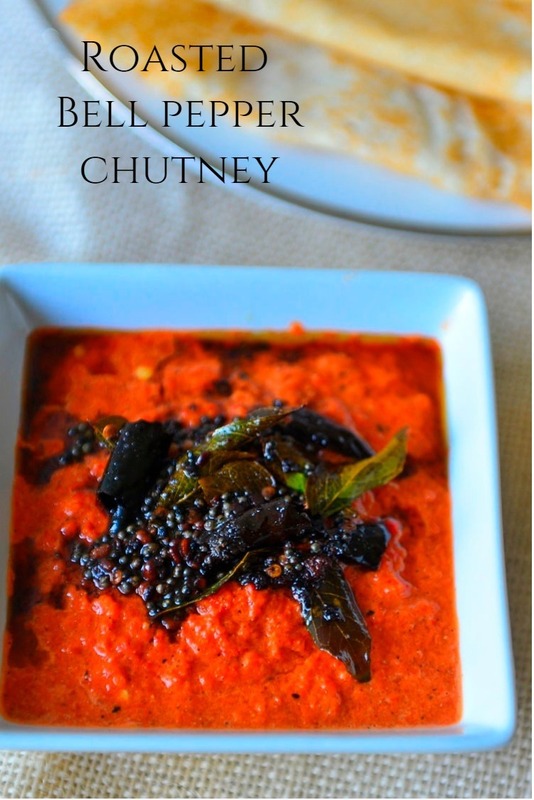 Roasted bell pepper (capsicum) chutney is a delicious side dish for many south Indian meals. The roasted red peppers have a slightly sweet smoky flavor , when paired with tamarind and chili powder it is a mouth watering combination that can perk up even the plain flat bread or rice. 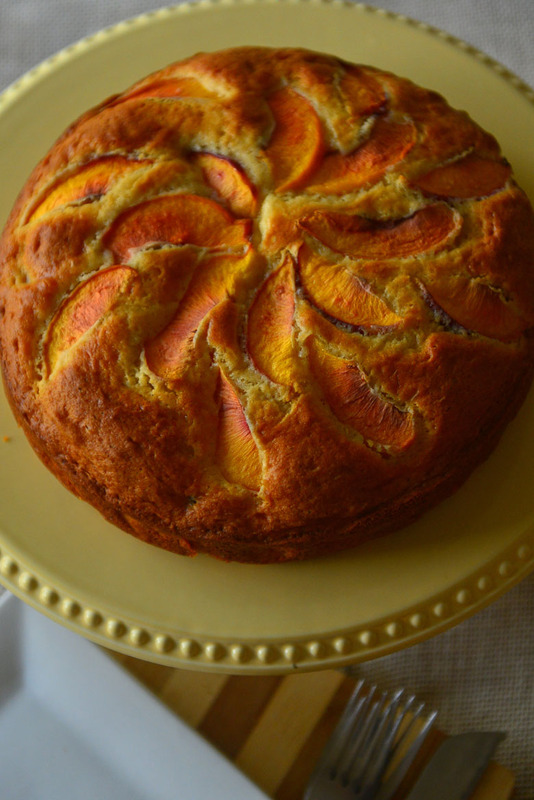 This fresh peach cake is one sure way to enliven the boxed cake mix ! There is fruit in the cake and on it too. It looks pretty and tastes delicious, what is more there is no need for an icing !! Less sugar More flavor ! 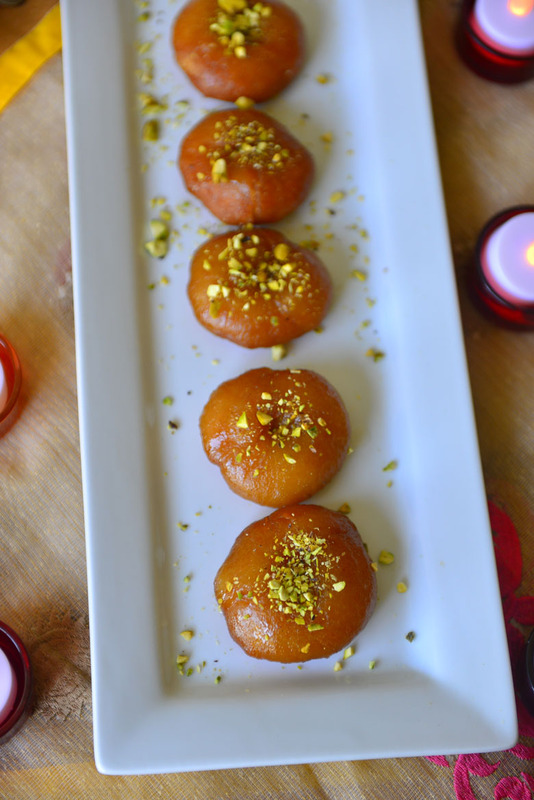 Think of flaky fried doughnuts, and imagine them dunk in sugar syrup – there you have it the popular Indian Sweet – badusha. Mine are not the best , in fact they don’t even stand a chance against the ones made by moms across Indian Kitchesn – but these will still disappear fast ! 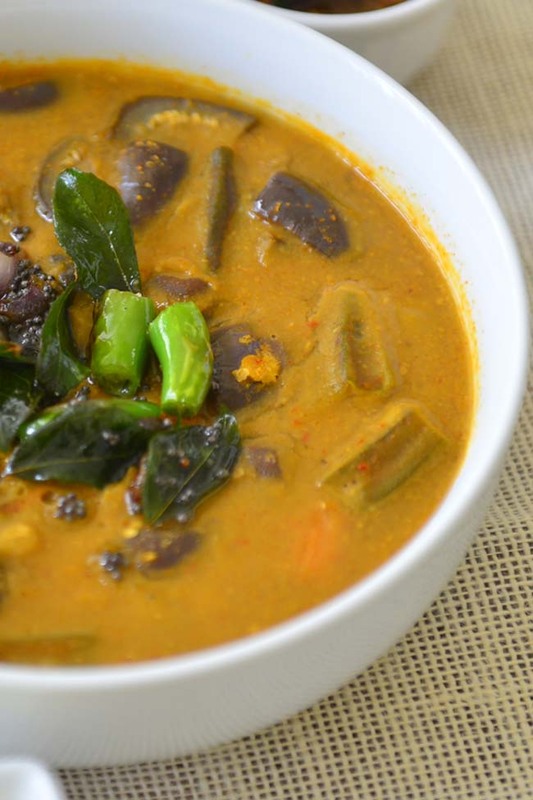 Sambar is a spicy and tangy South Indian dish made with lentils and vegetables. This version of sambar is popular in Kerala and is usually made for special occasion meals like sadya. The mix of lentils and vegetables make it very nutritious and when paired with rice it becomes a complete meal. 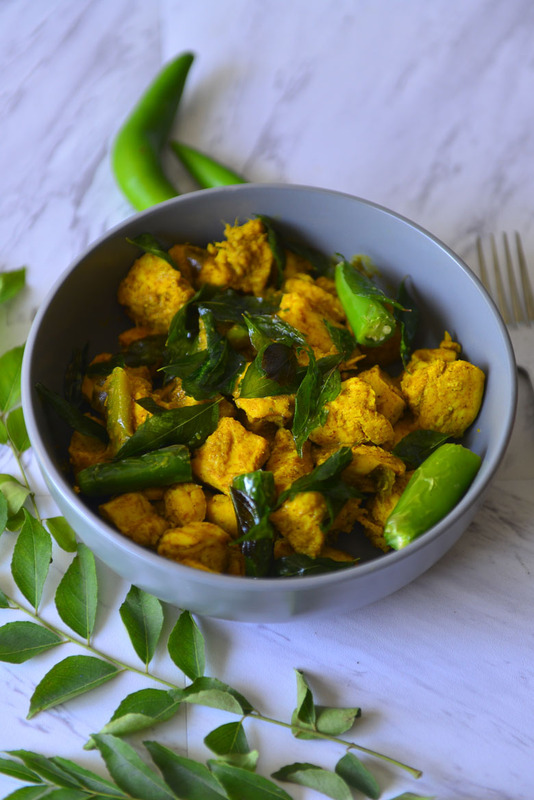 Bite sized pieces of chicken coated with a creamy mix of spices and finished with curry leaves. This is an easy and delicious appetizer to make and share with friends and family. On second thoughts – sharing is definitely overrated ! 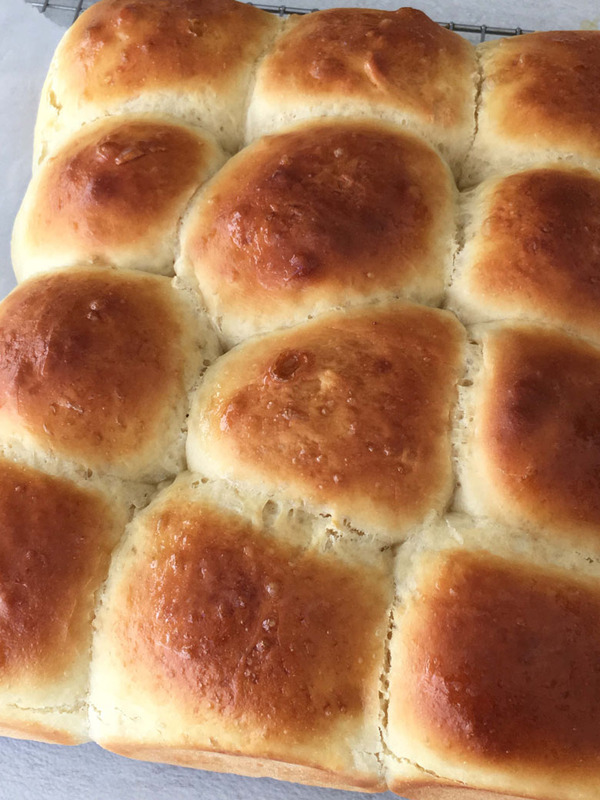 Delicious dinner rolls are easy to make using this recipe. These dinner rolls come together in just 2 hours with no kneading at all. Fresh bread right out of the oven with the least amount of effort and it is all real food ! Turmeric is known for its healing properties. 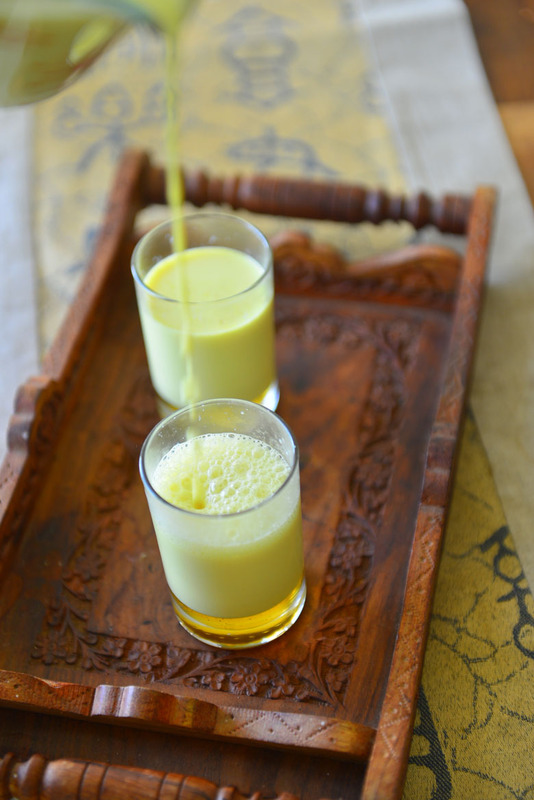 This milk is infused with turmeric and the added spices aid digestion and add more flavor to it making it an irresistible drink. Hard boiled eggs with a spicy mix of onions encased in a pastry shell or what we called egg puffs is a favorite tea time snack. These are not just tea time snack, pack a couple in the lunch box along with some fruit and it turns into a hearty lunch . 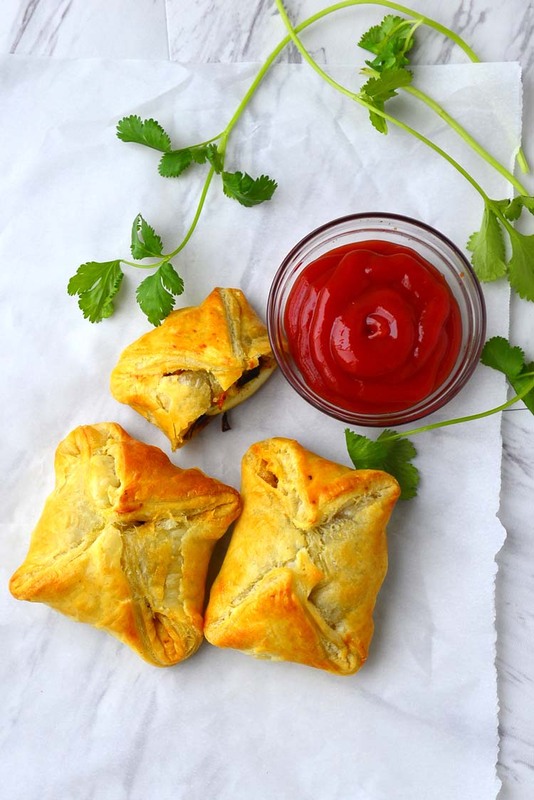 This is easy to prepare , especially when you have pre-made puff pastry sheets.